First, open your App Drawer and launch “Google Settings”. On this screen you can see which apps have recently accessed your location data. If you see suspicious activity going on here, you should really look deeper into it for security and privacy reasons. If you want to disable location tracking on your Android device just for the sake of saving battery life, I advise you to change the “Mode” (see screenshot above) to “Battery saving”, which will disable GPS, and only use Wi-Fi and mobile networks to determine your location. Besides communication your location to third-party apps, Google also collects your location data and stores it on the company’s servers. You might actually be quite surprised to see how much data Google actually has on you. If you want to see what location data your Android device has already sent to Google you should check out this page to see a map of where you went and when. 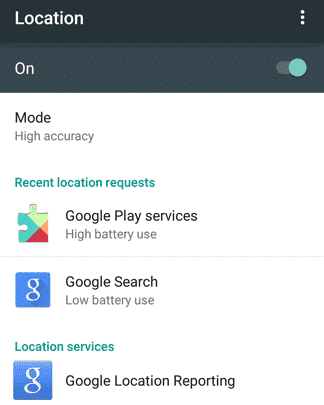 If you want to turn off this feature and don’t allow Google to collect and store your location data in the future, all you have to do is open the Google Location Reporting settings (also seen in the screenshot above) and disable “Location Reporting” and “Location History” on your Android device. Turning off all these location services has both pros and cons, and it’s only up to you to decide if you want to make use of Google’s and other apps’ location-based features or if you care more about privacy then convenience.